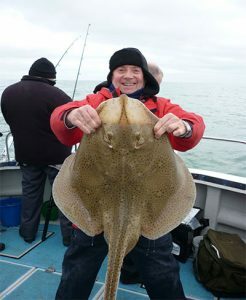 This covers a wide range of fishing from the tiniest mini species to large Rays and Tope. Try to find out what the plans are for your day afloat so you can bring the appropriate rods/reels/ tackle and appropriate bait. Within Poole Bay and along the Dorset Coastline we are blessed with many different seabed features ranging from open sand which attract Plaice and Gurnards to rocks and reefs which attract so many different species ranging from mini species to Conger eels; Big banks that produce Rays, Tope, Turbot; tidal rips that attract Bass and Pollack; and wrecks that can throw up anything. Forward planning allows you to enjoy your fishing and not be left asking why we are fishing for Rays when I only bought a light spinning rod thinking we would be Plaice fishing all day. 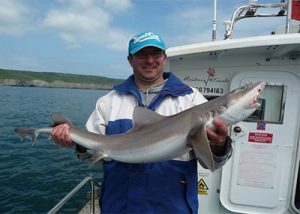 Smoothhounds are one of the more sporting fish found inshore and as a shark look alike always give the anglers new and old a thrill! Their favourite bait is crab which will seek out the better fish, but many are caught using squid and ragworm cocktails. Using light fishing tackle allows the full sporting potential of these fish to be enjoyed. Keep tactics simple, I prefer a flowing fluorocarbon trace with a fine wire or dedicated crab hook and bait elastic to keep the crab on the hook. 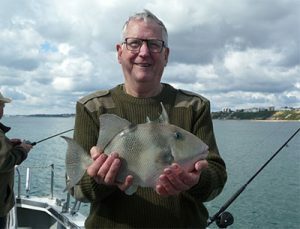 Exotic Trigger Fish are much sought after by anglers as their fighting abilities for such a small fish are one of the best we have in British waters – these fish tend only to be caught from August to mid-October. Many anglers fish for these and have yet to succeed. Again keep tactics simple, use good quality hooks as Trigger fish have incredibly strong teeth and can easily break lesser quality hooks. Poole Bay is famous for its range of mini species and holds dedicated species competitions yearly enticing world class anglers to take part. Rods will vary in length from 2 metres to 5 metres ranging from light spinning to 30lb class. Many of today’s rods come with different rated top sections allowing 1 rod to cover all inshore fishing applications. Rod length is down to the individual angler and for new anglers I would recommend a shorter more manageable length of around 2 metres to start with. Reels can either be multiplier or fixed spool, this is entirely down to your preference. Competition / international anglers will use longer rods up to 5 metres with a selection of quiver tip top sections allowing them to target species and areas shorter rods are less likely to reach. A good selection of trace line ranging from 10lb to 50lb is required and even heavier if you are chasing Tope. On the hook front, again a selection is required, but you will often be surprised how a large fish can be caught using the smallest of hooks. Most people have a selection ranging from size 6 through to 6/0. Traces vary and are down to personal choice, many people buy pre-made rigs such as feathers for Mackerel and general usage rigs, whereas other anglers will pre make all their own and have a full range from simple flowing traces to 3 hook set ups ready to change depending upon what they are targeting. When using pre-made rigs ALWAYS check all knots for security. Dependent upon which species you are after determines the bait selection required – local Ragworm, Squid and Mackerel are the main ones used to cover most types of fishing. These can be supplemented with uncooked prawns , mussels, crab and lugworm to name a few. Once you have found out your target species and their preference for bait prepare this on the journey out to the fishing grounds saving fishing time. 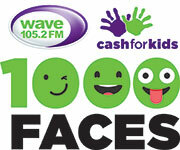 A single size 4 fine wire hook on a 1000mm trace is the most commonly used set up and the easiest to sort out. Over the years I have seen so many variations, ranging from the most elaborate multi boom rig to the Christmas tree special, but by keeping it simple you spend more time fishing, are more relaxed and catch just as much over the day as multi hook rigs. Many anglers hold their rod all day whilst others put them in the rod holder sit back and relax. Both methods catch fish but the angler who holds his rod, works his bait and is in touch with his bottom gear will have the better catches. Once you have been fishing a few times you will develop your own style and preferences to which works best for you, but I advise you to keep looking around you to see what other anglers are catching on and always be open to advice. 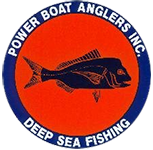 To find out more about our technical rigs and inshore fishing methods please call or contact us via our enquiry form.